29 April: detentions by OMON riot police in Petersburg. Source: MDK / Twitter. We continue our partnership with OVD-Info, a Russian NGO that monitors politically-motivated arrests. Every Friday, we bring you the latest information on freedom of assembly in Russia. This past week has seen the culmination of the country-wide #We’veHadEnough (#Надоел) protest. Read about the detentions here. In St Petersburg, for example, Dinar Idrisov, a rights defender, was detained particularly harshly at the city’s Police Station 22, which he was visiting in order to represent the interests of people detained at the protest. 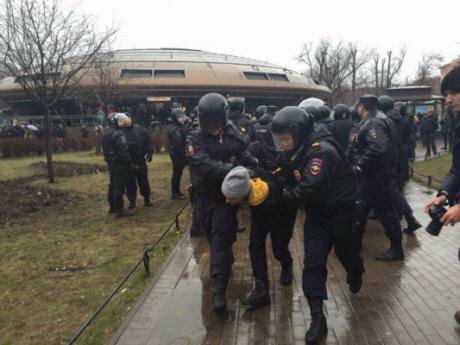 Police officers pushed Idrisov to the ground and handcuffed him. He then spent the night in the station, and the next - in court, where a judge examined the administration case against him for not following a police officer’s instructions. On 2 May, the court fined Idrisov 1,000 roubles. You can read more about this here. The Russian authorities and employees of educational institutions continue to pressure young participants of protests. One #We’veHadEnough protester in Petersburg, for instance, was forced to write a letter explaining her actions in school, and threatened with being placed on a register of problematic children; and in Samara, students at one gymnasium were sent to see the school psychiatrist after a teacher overheard them talking about Alexei Navalny. The authorities’ pressure sometimes becomes quite serious — members of Russia’s Center for Combatting Extremism visited a school pupil who’d written a comment online about Navalny’s protest; and in Kaliningrad, a pupil at cadet school was expelled for participating in #We’veHadEnough. In the Kaluga region, the regional ministry of education revealed how they have lists of students who go to protests, “who will in the future impede our lives”. 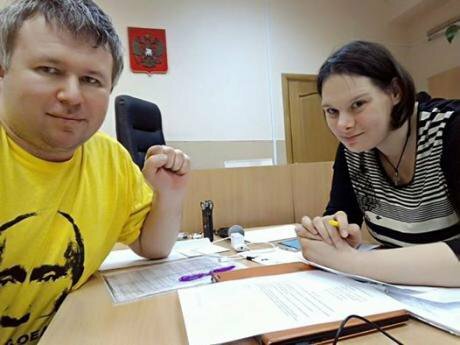 Dinar Idrisov and Ksenia Mikhailova at Petersburg's Police Station 22 this week. Source: OVD-Info. There’s been attacks on activists, too. The moderator of an social network group “Muscovites against demolition” was beaten up by four unknown assailants. A lecturer at the School of Journalistic Investigations was also attacked. Alexei Navalny has been the least lucky: he was attacked with a unknown substance, and there’s a chance that he will lose his vision in one eye. The police have opened a criminal case into the attack on the politician. And a court has legally recognised the sentence against Navalny and Pyotr Ofitserov, which serious reduces the chances of Navalny participating in the presidential elections. We take a look at the SERB movement, the alleged people behind the attack on Navalny. In Ekaterinburg, the prosecution in the Ruslan Sokolovsky case is requesting three and a half year sentence for the blogger, who made a video of himself playing Pokemon Go in the city cathedral. But there’s good news, too. This week, Alexei Sutuga, an anti-fascist activist, was released after three years in prison in Angarsk. Check out his case here. Russia’s Investigative Committee has finished its investigation into three of the four men under investigation as part of the 26 March case, and Yuri Kuliy’s case has already been sent to court. We spoke to the friends of Alexander Shpakov, who’s accused of hitting a police officer several times. Ivan Nepomnyashchikh, a Bolotnaya prisoner, has not been released from isolation prison after he was beaten up by prison officers in a Yaroslavl prison colony. On 28 April, European Court of Human Rights demanded that Russia account for its investigation into beatings in Yaroslavl Colony No 1 — as Sergei Sharov-Delone, Nepomnyashchikh’s legal representative, tells us, the prison administration isn’t rushing to fulfil these requests. Arma17, a music promoter group behind various festivals and concerts in Russia, has announced that it’s stopping work in Russia. We’ve got the details of the pressure Arma17’s under here. Find out how to survive and protect yourself from political prosecution. Thanks to everyone who continues to support us. Find out how you can help here.